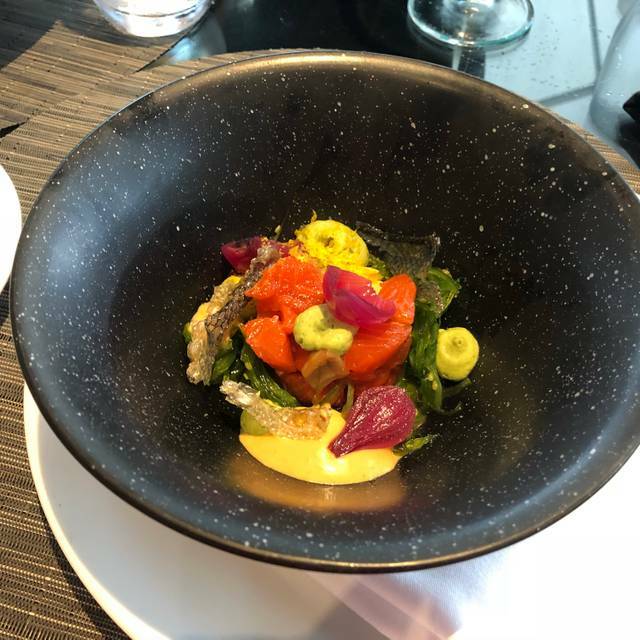 A true gem of the Inner Harbour, AURA waterfront restaurant + patio is Victoria’s premiere dining destination for Pacific Rim inspired cuisine. Featuring an eclectic winelist, island microbrews and handcrafted cocktails, enjoy spectacular harbour views from the dining room, bask in the glow of the under-lit Onyx bar, or relax on the waterfront patio. For larger gatherings, retreat to AURA’s private dining room, where original works of art keep you company. AURA is placed perfectly to watch the world go by. Complimentary Valet or secure underground parking available. It was our 12 year anniversary and i wasn't not disappointed. From the amazing customer service (hostess, manager and of course our waiter/server) to the chef's dishes. Our food was cooked to perfection and delicious. 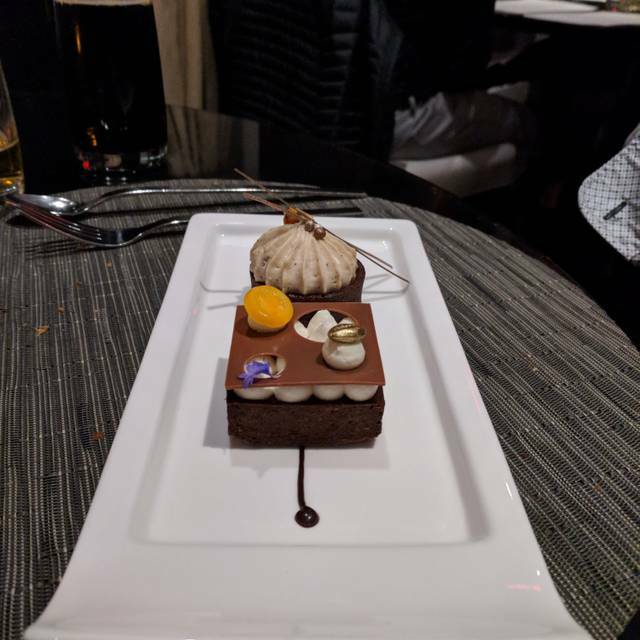 We were also surprised by the pre appetizer supplied compliments of the chef then for a final congratulations on our anniversary with chocolate acknowledging Happy Anniversary from the chef. Amazing atmosphere and incredible food. Thank you Aura. We're looking forward to returning in the Spring of 2019 once your renovations are complete. The desserts can be improved. Pricey with a limited menu, but the food was excellent, wonderfull service & fantastic view. It's on the road less traveled. On the opposite side of the bay across from The Empress Hotel. So it is much quieter than the more tourist oriented areas. Nice location next to the water but the food is just ordinary breakfast fair that could use a bit of seasoning and updating. It is might be worth going to just to sit and enjoy the surroundings. Breakfast was very good with a great view of the harbor. Every dish handle excellent, we had oyster and soup to starter. Oyster fresh and juicy, mushroom soup nice and creamy. Main course we had duck and seafood. 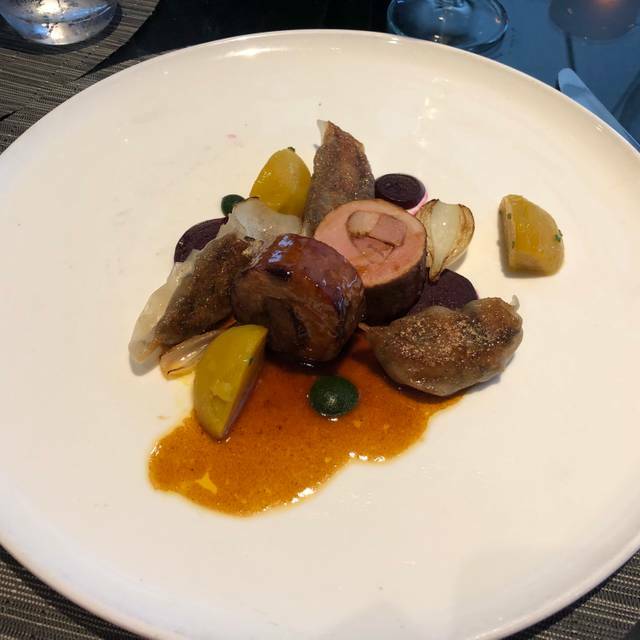 DUCK was very tender and vegetables are well cook. Sauce keep the whole plate well balanced. SEAFOOD also had excellent flavor, prawn did not over cook with a bit grill mark, squirt and scallop also keep whole thing very playful in your mouth. Overall, it is great place my wife and I had great time for our anniversary. Thank you Chef and all service staff. We will return soon. We spent celebrated our engagement and the staff was so welcoming, warm and felt as if they were celebrating with us. Food was terrific! Unfailingly good food at dinner and breakfast. Asked nicely about allergies, and provided attentive service throughout. We chose to eat there for two of our three nights in Victoria. Beautiful setting too. Lovely to watch the harbour lit up in the evening. Service was very good. Your booking app is a little overboard as well. I received two telephone calls and several messages both before and after the dinner. That's too much contact. Our waiter was excellent, with prompt service, and just attentive enough. All of the food was excellent. The flavors really popped. A bit pricey for portion size, but I think quality makes up for that. Thanks for a great evening of delicious food. Food menu had unique items. Overall delicious but quite rich (too much butter on most everything). Breakfast menu has some delicious healthy options. Supper portions seem small for price. Great restaurant. Somewhat limited menu. Very pleasant on the patio, but the piped-in techno music and noise from seaplanes were annoying. Excellent service from the valet who parked the car (we required special arrangements, which were handled graciously) to the hostess at the front desk. We made a reservation to treat a friend who was visiting town, and it was a beautiful day, so I inquired whether we could sit outside, which I had failed to mention when I made the reservation. The hostess replied that they had reserved both an inside and an outside table for us, so we could have our choice. Now that’s classy! 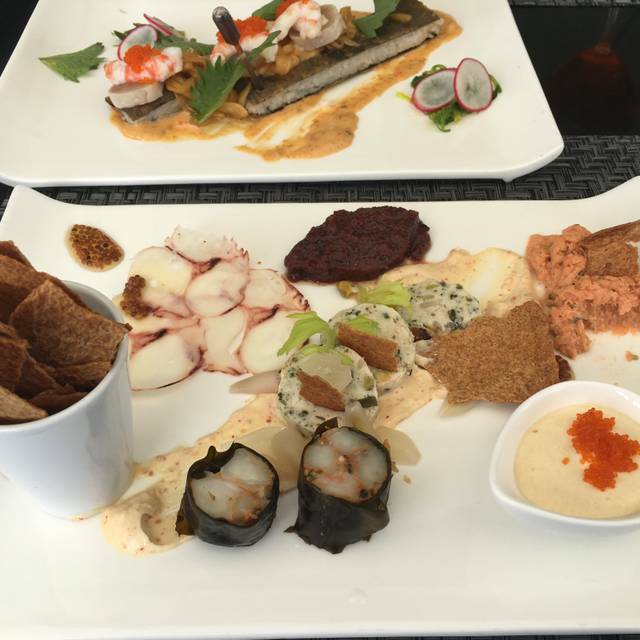 I recommend both the seacuterie (many interesting seafood bites, one of which they happily agreed to substitute for, at my request, based on my prior visit) and the sushi (delicious, but not at all like other sushi’s I’ve had). This was my third or fourth visit, and I like these items so much that I haven’t yet tried other alternatives. But I hope to in the future. Our new goto restaurant to take visitors to! We had lunch on the patio. I asked for a view as we were with out of town guests and we were seated right in front of a huge tree. We didn’t ask to move - as the ambience outside was relaxing and sunny. The cheeses and Asian inspired appies were excellent. The fish and chips were ok but definitely not the best in town. I had asked for a special table with a water view and they reserved the best one in the place for us!! And everyone wished me happy birthday! Lovely experience! Food was amazing and delicious as always. The best view of the harbour in the city. Thank you! Nice to see Frances at Aura. We know her from her years at Zambri's. She is so personable and knowledgeable and Aura is lucky to have her. You may share our feedback with her. Good healthy food . Very small portion. Was perfect for us girls. 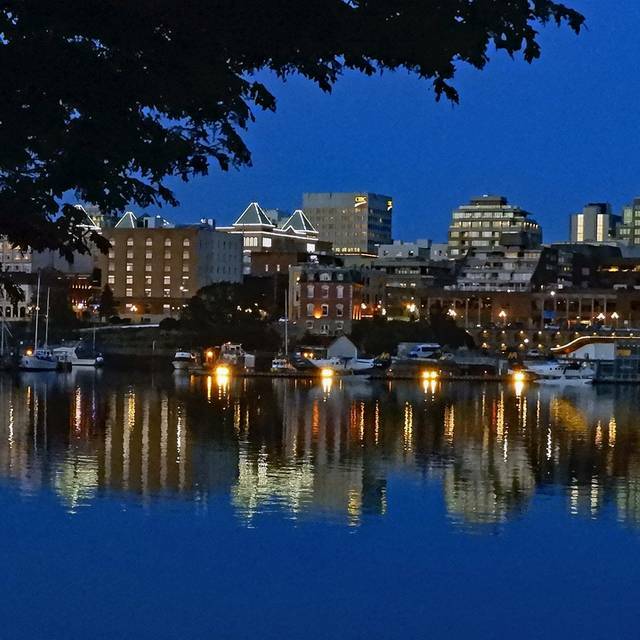 A visual and sensory feast in Victoria's beautiful Harbour. The Seacuterie plate was gorgeously presented, as was the cheese plate. We appreciated the little attentions, such as a warm blanket, offered to us as the air became chilly. Aura is perfect for pre-show dinners and a pleasant walk from our major attractions. I will be going back many times, with friends, family and for anniversaries. Superb, well-trained and attentive staff made this a warm experience. Such a relaxing meal in a lovely location. Pleasant service. Delicious food! Wonderful food - a taste sensation in every bite. Beautiful view. A very special night for both of us. Thank you for the wonderful service, fabulous food and pleasant atmosphere. Amazing food and prompt service. Definitely an experience worth having. 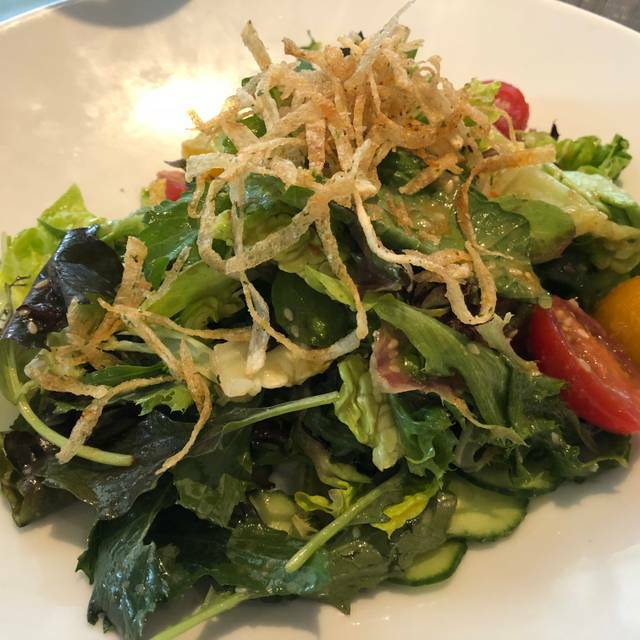 Aura's creative, delicious cuisine, attentive service, and gorgeous harbor view make for a first-class experience. The bruleed foie gras, watermelon salad, and duck and pork presentations were as beautiful and innovative as they were tasty. We even received our dessert, "The Bar", on a plate inscribed with chocolate to commemorate our wedding anniversary. It was truly a memorable night! Waitress was cold as ice and almost ruined the evening until the maitredee stepped in and professionally addressed the concerns. 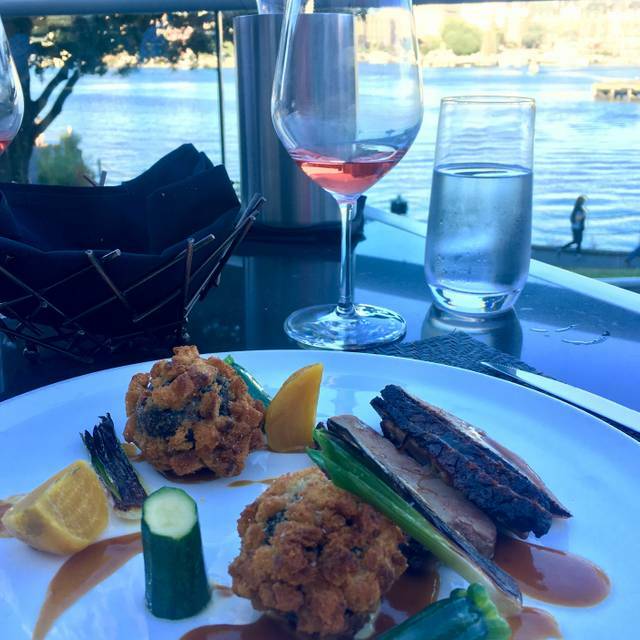 We are visiting Victoria a couple of times a year to enjoy a "dining" experience and enjoy the city itself. This weekend we went to AURA (we found it via online reviews including Yelp) and booked via open table. The meal was wonderful. I had what was probably one of the nicest steaks that I have ever had and my partner enjoyed his duck. I had a delicious salad to start and he had a fried dish (cannot remember what it was called but he stated it was sublime)!! Would definitely recommend this restaurant. Fantastic harbor view patio restaurant with gourmet food. So relaxing to enjoy the lovely summer evening. A treat to have delicious beverage and food choices. 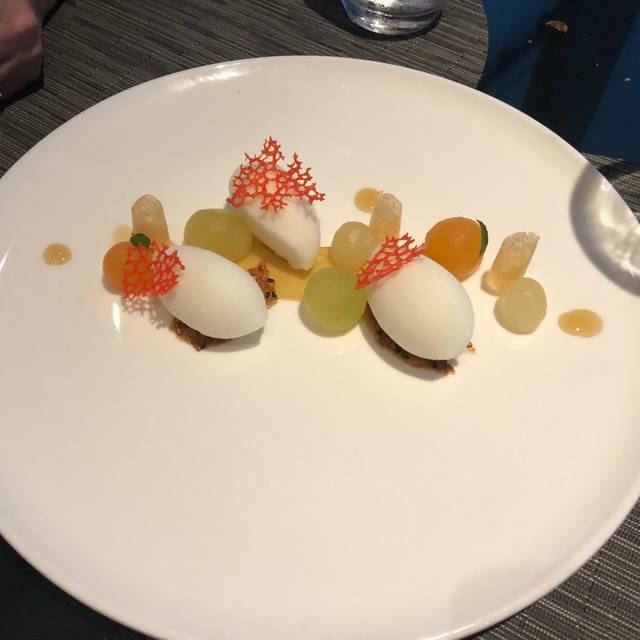 All items on plate were described to you when they arrived. We enjoyed salad, salmon and halibut. 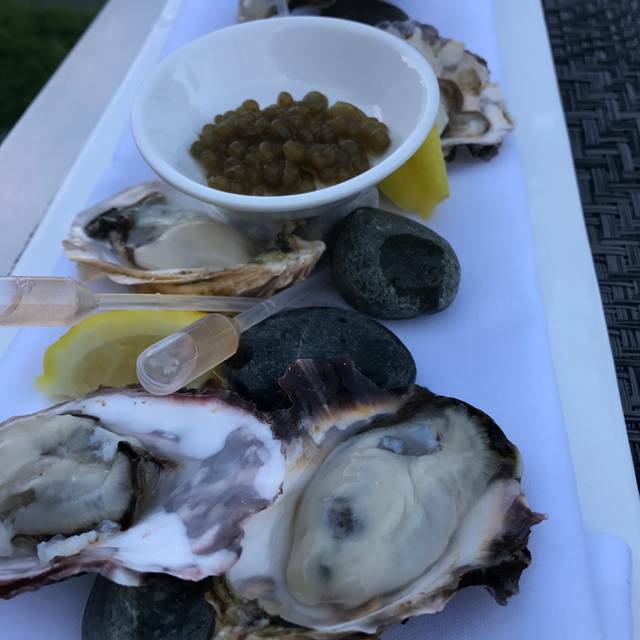 A little disappointed in the 1/2 dozen oysters; very small and flavorless, unfortunately. Staff were attentive and so thoughtful to offer a “blanket “ as evening became a little chilly. Looking forward to a return visit. It’s all about the food. Excellently prepared, the portions were just right and delicious. Quiet so you could actually hear yourself think and carry on a conversation. Recommended. Everything was great for an evening with friends. Server a bit inexperienced. Food and drinks were ok as was the service was ok. The view is the reason to go! We have been here for lunch a couple of times, so decided to try it for dinner, and enjoyed it very much. However, some of the dishes were too pricey (in our view) for what they were. We did not like the mixed green salad because it had soya sauce in the dressing; too strong in a salad. In our main dishes, there should have been more veggies to give a better balance between the meat/fish and other ingredients. Below, we do not know what you mean by "authentic"; authentic what? And what on earth is Paleo-friendly? My family went for a special occasion and got a great table on the patio. The heater and blankets were welcome but not needed as it was a warm night. The others in our group had great meals and the wine selection was very good. I am vegan and there was no options for me but I altered the vegetarian options. It would have been nice to have more selection as there was only one choice. In retrospect I should have asked if the chef would create something for me as I read he is very accomplished. I might ask for that next time! As always the view was exceptional. Aura's servers are knowledgeable and attentive, as well as sensitive to our desired pacing. The wine list is thoughtful and features a fine range of British Columbia wines. The menu had a good range of creative offerings. Usually the food lives up to the rest of the experience but on this last visit it just didn't reach the expected excellence. I am sure this was just an off night in the kitchen, so this one slip won't keep me from coming back.